On Saturday 12th May, myself and others were protesting in Twerton High Street about the proposed redevelopment of Twerton Park. None of us are against redevelopment per se, but we have concerns about the current proposals and, respectfully, with the lack of transparency in the consultation process with residents. From a community perspective the situation has become intolerable. I'm able to politely answer questions (and flak) about the protest if people would like to comment here. What I certainly won't be agreeing with, is any line which maintains that it's somehow "premature" to take a negative view of the proposals so far. Because I'm a newcomer to the forum, I'm restricted from posting a link to the flyer which outlines most of the problems. But you will find it if you scroll down this thread. On such an important matter as this what has been the response from B&NES and local councillors Tim Ball and Joe Rayment? As far as Bath City plans are concerned, these are at an early stage and at the moment I can only describe them as work in progress. They are not acceptable in any way on their current plans. I’m meeting the Chairman and other board members shortly and will bring the points that have been raised to their attention. This current plan will cause further parking problems and needs more attention. The promise of low cost housing needs to be defined as well as the missing element of housing for key workers. I support the concept of redevelopment of Bath City but not at any cost. Twerton residents' viewpoints must be taken into account and I would urge them to make the viewpoints known. I would highly recommend that people take part in the consultation. I understand that some are sceptical and think they'll be ignored, but if you don't take part then you can guarantee that you'll be ignored. I am generally supportive of development of the ground, and I think it could be great for the area with a boost to the local economy and space for community services. I also understand that there will have to be compromises to make a scheme financially viable. The extent of these compromises will guide whether I support the final plan or not. I attended the consultation at the weekend and gave my thoughts there, but it would be absolutely wrong of me to decide on a position as a whole before the final proposals come forward. Joe Rayment is in a trickier position than Tim Ball, having previously voiced a lot of support for the football club. After all, it's a good 'socialist principle' to have a football club that's community owned. The trouble is: this is a socialist principle gone a bit pear-shaped -- with leaders who live outside of Twerton wanting to construct student blocks that the Twerton community itself doesn't want. Together with the parking problems and other issues, Twerton has to pay a price for a team that few people in the area are interested in. Where are you getting your information about the height of student accommodation and the Magic Wok? The most detailed info on the regeneration I can find is here http://www.bathcityfc.com/wp-content/uploads/2018/04/exhibition-boards-WEB.pdf which only gives a rough idea of plans for the initial public consultation. The deadline for feedback was Saturday 28th April 2018, so if you got your feedback in by that date it will be considered. If you didn't get it in by that date then a further round of public consultation is promised later in the year when more detailed designs will presumably be available. All I can suggest is that you participate in these consultations. My personal view is that the loss of parking spaces will be a concern but there needs to be some trade-off with the need for student accommodation (as stated within the proposal, this is a financial necessity). I would hope The Magic Wok could be accommodated in the retail redevelopment. There is no suggestion that existing retailers wouldn't be rehoused. also a strip of land behind the shops and the football club’s car park." So has Bath City FC lost ownership of the car park? From Section 8 "Scheme Layout"
If blocks of property are built in the orange or purple sections higher than the existing parade of shops I can see why there may be objections from residents, especially those living opposite in the High Street. As has already been said, existing facilities / occupants ought to be incorporated in any new build if they so wished. Thank you. It's time for me to take a siesta before work this afternoon, but perhaps I can comment on the height of buildings and some other things. The consultation materials you link to, show illustrations of proposed student blocks on page 7. This is what residents have been shown to prompt their feedback. What residents weren't either shown or told, is that such blocks would protrude significantly above the High Street. Below is an image I cobbled together to make this point clear. If local people had been shown or told this, they might have given a different set of responses. Instead, there's poorly informed resident feedback going into the third consultation stage, because the process hasn't been transparent. Now, how many directors does the club have? About a dozen? I take it they all go to the football ground. They're all familiar with the level of the football club carpark. Did they really all miss that residents needed to be told about the visual intrusion above the High Street? You can begin to see why residents get suspicious. But they don't point out the parking issues that would be caused around Twerton by the club building over its carpark. Residents are just left to deduce this for themselves. (What happens when a match is on and students and gym users bring their own cars?) So that's another lack of transparency. In the above picture, I've added the label "Student blocks" for clarity. The original material doesn't have it; instead it uses a key. You have to look at the key to see what would be built behind the High Street. It tells you "Student Accomodation". You have to refer back to page 7 to remind yourself that the student accommodation is, in fact, five storey blocks. Can you see how the materials veil the fact that these big blocks would be looming above the High Street? I don't mean to offend anyone, but the consultation process has been bent. And that's one reason why it isn't premature to start challenging now. I read it as: the bit between the shops and the football club car park. I would hope The Magic Wok could be accommodated in the retail redevelopment. There is no suggestion that existing retailers wouldn't be rehoused. Same here. Or somewhere among the community section. I think that might make good business sense too: go to some live music and pick up a Chinese afterward. But you understand the Tangs who run the Magic Wok have been given notice to leave the premises by December, with no assurance that they'll be housed anywhere else. I would agree that the photo used to illustrate student accommodation has five storeys, but I read it as just that: an illustration. Looks like a stock photo to me. There is no real detail on how tall that accommodation would be, or indeed how tall the retail redevelopment would be. Joe Scofield wrote: Thank you. It's time for me to take a siesta before work this afternoon, but perhaps I can comment on the height of buildings and some other things. I can understand that there will be residents who will be wary and nervous about this development. Major change is always difficult, and there are many key issues that absolutely need addressing such as the car parking. But there are a number of things in the leaflet you've posted above that make me feel very uncomfortable with the route this campaign is choosing to go down. Firstly, it has taken a rather anti-student tone throughout, as if it was paedophiles the club was looking to house rather than young people who generally make a very positive contribution to our city. The bottom line is that no-one else - not social tenants, not private tenants, not families, no-one - would be prepared to live in small accommodation that's right next to a football ground in the numbers that would make the overall project work. So I think it's false to suggest that it's a straight choice between student and 'family' housing. Without the student element, I just can't see how the entire project would work. So in reality I think the choice is between student housing with a small amount of social/family housing, or no housing and no development of the site/area/High Street at all. As I just can't see how the economics would stack up otherwise. I'm also uncomfortable with an assertion that anyone is speaking on behalf of the Twerton community on this issue without robust evidence that they do so. Can this be provided please ? I also think it's completely unfair to claim that Magic Wok "is being chucked out to make way for yet more students!". It isn't. 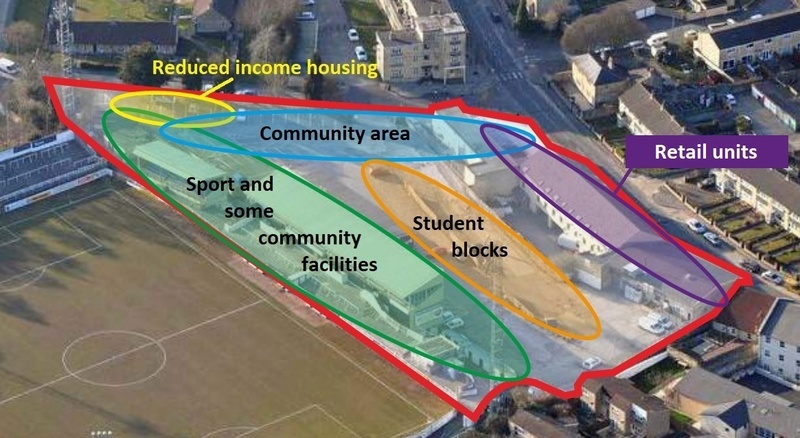 The building it is in is part of the overall proposed regeneration of the stadium and Twerton High Street, which includes student accommodation but isn't entirely about that. So you may as well claim that Magic Wok is being chucked out to make way for football fans, community facilities, sports facilities or family housing as much as students. But we all know that students are the easy target, which is why they've been disingenuously chosen. In fact - as your own map above shows, the space currently occupied by the Magic Wok is set to be the Community Area under the proposed new scheme, and not for student housing. If the stadium project collapses there is a good chance that the current owner or someone else would redevelop that and other buildings anyway - completely independent of the football club or even students - which may or may not see the Magic Wok closed. Or they may or may not be relocated as part of this whole proposal. Either way - ringing alarm bells and blaming students for their alleged demise is not helpful in my opinion. As for the height of the student buildings - I would have thought most people would appreciate that a new 5 storey building would be taller than the existing 3-storey structures in front of it ? But again - I don't think it's helpful to go down the route of conjecture for how high the buildings may appear above the High Street. It all just feels like more scaremongering IMO. Finally - Twerton High Street has been slowly dying for years, and since the Co-op left has been on the verge of being read the last rites. I don't see anyone else looking to regenerate the High Street, and without a major project like this I don't see how any regeneration of it would have the scale to make any real difference to its downward trajectory. An influx of students would also breathe much-needed new life into the High Street, as they represent entirely new money being brought into the city, a lot of which would then be spent locally. And that's before we get onto the fact that some of the students there would get actively and positively involved in the local community too. So for me, I would say the choice is between the status quo of a dead High Street, a run-down unsustainable football stadium and no student housing versus an improved community-owned football club, sports facilities, community facilities, social housing, shops and - yes - a relatively small number of the dreaded two-horned students in the area. As has been stated earlier, this will all be about compromise and how to get it configured in the right way. 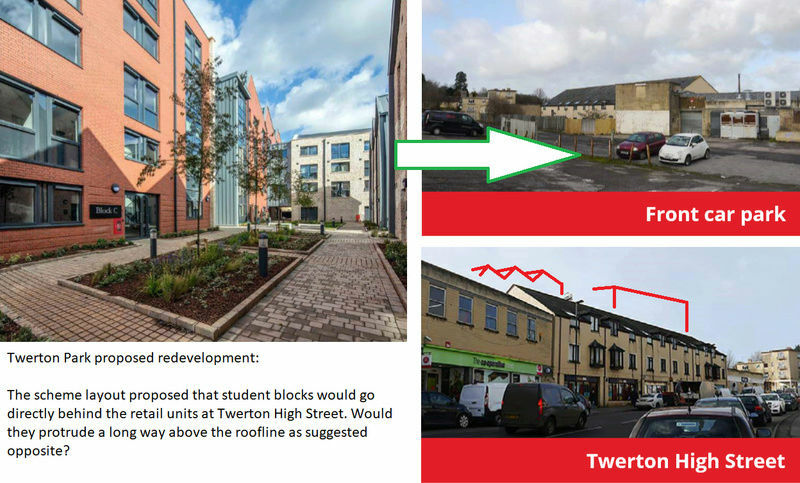 But this project will bring huge benefits to Twerton, such that I think it is deeply misleading to make it all about students and their impact. You have every right to campaign against this proposal, and doing so is good if it makes the end proposals better. But I would appeal to you not to go down the route of this looking like an anti-student thing, as it will undermine the points you are seeking to make. And I would also ask that you reflect on what else would work financially to give Twerton the shot in the arm that it needs before its High Street is read the last rites. Compromise is needed, and whilst some people may not instinctively want students in their area - I'm sure the same people would also welcome the local facilities and employment that are unlikely to come to the area in any other way. The crux of the matter is that you say there has been no community consultation and yet you appear to have ignored the consultation that has already taken place describing it as a stitch up. Not a single detailed plan has been presented by the developers, only general ideas, but you are making detailed specific points in opposition. None of the shareholders of the club are aware of any specific plans because there aren't any. The developers are still exploring ideas. However I believe if you brought your genuine concerns to the club, it would endeavour to address them. The club is trying to engage with the community but the community needs to be prepared to reciprocate. Are you prepared to engage? Clearly the NIMBYs trying to get in before firm plans are even produced. Still, at least the 'community' is getting involved in its club. Evening shift over, I've been to the gym and got some sleep. Now time to answer some of these. My body clock has an unusual pattern nowadays. This is an assertion which I think serves as a smokescreen to the real issues. 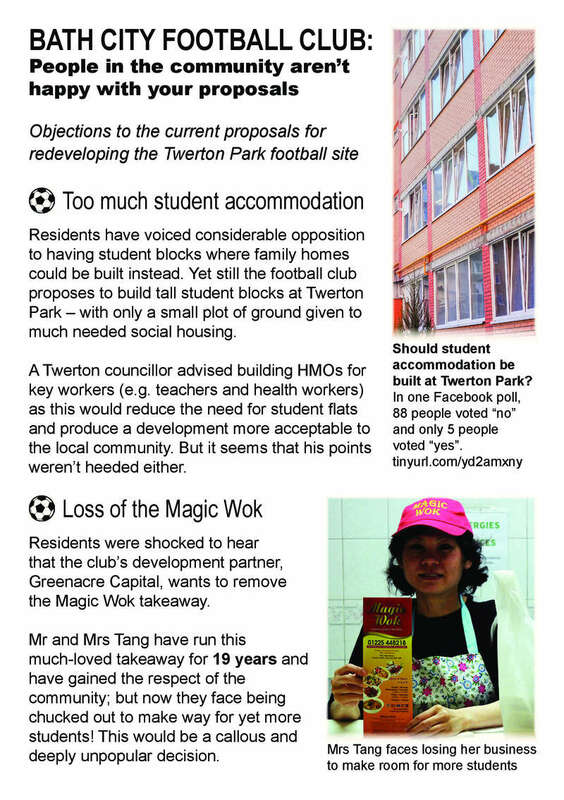 The leaflet protests that there is too much proposed student accommodation in the redevelopment of Twerton Park. The basis for this, is that there are some 4,500 households across B&NES on the waiting list for social housing -- and yet only a small plot of land is set aside for social housing in the proposed scheme. Most people see a moral issue here, independently of whatever one happens to think about students. Generally (though not always) I find that Twerton people are very politically correct on this issue. They don't base their arguments so much on characterisations of students. They object to the few bits of available land in the city being given to students, when there is such desperate need on the housing list. The council has taken some of the University of Bath campus out of green belt land, so that more student accommodation could be built up there, but still the unfair process goes on. I've also witnessed the problems myself first-hand. A few years back, I had a homeless family - an old workmate with his two children - live with me for 8 weeks while we tried to find them a place to live. It was a daily ordeal of phoning around estate agents, with so few private landlords renting to housing benefit claimants nowadays. There is also a pressing need to build suitable accommodation for the elderly. I've worked as a homecare worker, visiting the elderly in their homes. One man whose legs couldn't handle stairs was made to live in an upstairs flat. It meant that he was effectively housebound; but there was nowhere else for him to go. Then, because he was housebound and couldn't get out, his legs degenerated even more. My preference would be to build more housing for the elderly who have lived in Bath and made a lifelong contribution; rather than for students who haven't lived here, haven't made a contribution and for the most part don't intend to stay. This is an odd point, given that there are people who live in small accommodation next the the football ground. What about the elderly people who reside in flats at Hanna Close about 15 metres from the west terrace of the pitch? To the east, some people live in flats close to the pitch. Check out the aerial view: people already live close to the ground. To use your reasoning, one might also argue that nobody would be prepared to live next to a railway line, but people do. Without the student element, I just can't see how the entire project would work. Most probably true. But the campaign calls for less student accommodation. That's why a heading says, "Too much student accommodation". One difficulty is that the football club expects residents to just take its word for it, that building mass blocks of student residences is the only way it can keep itself afloat. The club should provide a numerical case to back up its claim. I asked a director for this and she said she'd try to supply it; but you know before you've even finished reading the sentence that you're not going to get that. Given previously mentioned issues, such as the lack of transparency in the club's consultation with residents, one can't take the things the club says at face value. Embedded in all this is the profit margin that Greenacre Capital wants to make from the redevelopment. What would that be? A 10% return, or 20%? For reasons of transparency, will the investment firm be disclosing their viability assessment, so we can check? I think this is an attempt to defend the indefensible. Most people wouldn't do the mental juggling to perceive how the proposed buildings would cause visual intrusion above the high street (as well as shadow and shade). Moreover, it shouldn't just be down to local residents to deduce all the problems. The club itself should consider the pros and cons of its scheme and be upfront about them. If the club shows people a five storey building it proposes to build, then it should be made clear that this would loom up over the high street. A basic lesson in moral decency is required here. What worries me, is that answers like these are unsympathetic and in particular, fail to understand many of the Twerton community. Residents don't like student blocks. To have these imposed in the heart of Twerton, would have a psychological impact: feeding into feelings of depression and powerlessness. This is also a community that isn't experienced at scrutinising proposals and working out the implications. I'm very concerned that against this backdrop, the club hasn't been as candid as it should have been, about what it intends to do. An influx of students would also breathe much-needed new life into the High Street, as they represent entirely new money being brought into the city, a lot of which would then be spent locally. First of all, asking for say, forty fewer student flats would probably make no real difference to Twerton's economy. Nor is it even certain that a large population of students can revitalise local stores. The Oldfield Park area has received a staggering influx of students, but still the Scala has declined and thus has to share floor space with another retailer. The economic argument is actually very subjective, impossible to prove, and with factors that weigh against it. For example, small specialist retailers like butchers and bakeries, suffer when there's a lack of parking spaces in the high street. People are less likely to stop and purchase what they might otherwise have bought. (Banable the butcher at Moorland Road has this problem.) If students living in the student blocks bring their own cars to Twerton, as those in Twerton Mill already do, parking problems around the High Street might be exacerbated and the Twerton bakery is one such store that could suffer from this pattern. While we were conducting the demonstration, we met a resident whose partner is self-employed as a conveyor offering a 'me-and-my-van' type service. It's a big problem for him, when he comes back from a job and finds nowhere to park his van. The same must go for self-employed builders, plumbers, plasterers etc. So the parking problems caused by this redevelopment could be bad for business. It should be pointed out that while the suggested 'economic boost' associated with this redevelopment is hard the quantify, parking problems and ugly big blocks are real issues, affecting the amenity of an area and residents' enjoyment of the place where they live. I also think it's completely unfair to claim that Magic Wok "is being chucked out to make way for yet more students! Well I got the information directly from the Magic Wok -- and I wasn't about to demand to see all the documentation they've received. Apparently the plans are to go online in September. But certainly the owners of the Magic Wok are to leave the premises, with no assurance of being rehoused anywhere else. When this happens, it'll be one more example of the redevelopment doing the reverse of supporting the community. But the language of supporting the community is being used to sell this project to residents. The football club entered into an Memorandum of Understanding with Greenacre Capital, setting out terms and conditions. Since the club has expressed a interest in putting community at the heart of the changes (Consultation Materials, page 2), could it not have sought assurances over the Tang family who run the takeaway - and embedded these in the agreement? Or did the club just hang this family out to dry? Nobody has made any such claim. My point is that the current consultation hasn't listened to residents, or revised the proposals accordingly. It's been a process of going through the motions of listening without really listening. Nearer the top of this thread, is councillor Ball's statement that the current set of proposals are "not acceptable at any level". You don't get that when a developer is really listening to the community and making compromises. Not a single detailed plan has been presented by the developers, only general ideas, but you are making detailed specific points in opposition. No. I'm making general objections in response to the things we've been shown. That's because the club hasn't listened and hasn't been upfront about the problems with these proposals. These are the hallmarks of developers who try to ride roughshod over communities. Actually, I've organised a meeting between residents and one of your directors for this Saturday. But in regard to your positive portrayal of the club, the actions so far don't match the rhetoric. Let's hope this can change. It was a good outing today. Talking with people on the street it became very apparent that local people are not aware of what is proposed on BCFC site. Every single person that I spoke with were against the proposal in its current form and were ALL against student accommodation being on the site. 'I wasn't about to demand to see all the documentation they've received' - why not? There are plenty of statements being made above, some of which are based on assumptions, so why not get the facts first to back up your statement? Does the terms of the Magic Wok tenancy entitle them to have their current landlord secure them an alternative location from which they can run their business? Are Greenacre doing something that isn't allowed for in their landlord:tenancy agreement? Whilst unfortunate that they are having to leave, isn't it just that; unfortunate. If they wish to stay in the area then perhaps they could make an offer for the Twerton Chippy, up for sale since early in 2018? You see, this kind of hard rhetoric from some fans, fails to see the bigger picture. I'm not writing to convince you of my viewpoints -- I don't need to do that. Instead, I'm writing to inform you of why people have and will be demonstrating; to show you their way of looking at things. It's the surrounding Twerton community that the football club needs to win over, rather than alienate, and that means understanding the way that quite a large swathe of the community thinks and feels. 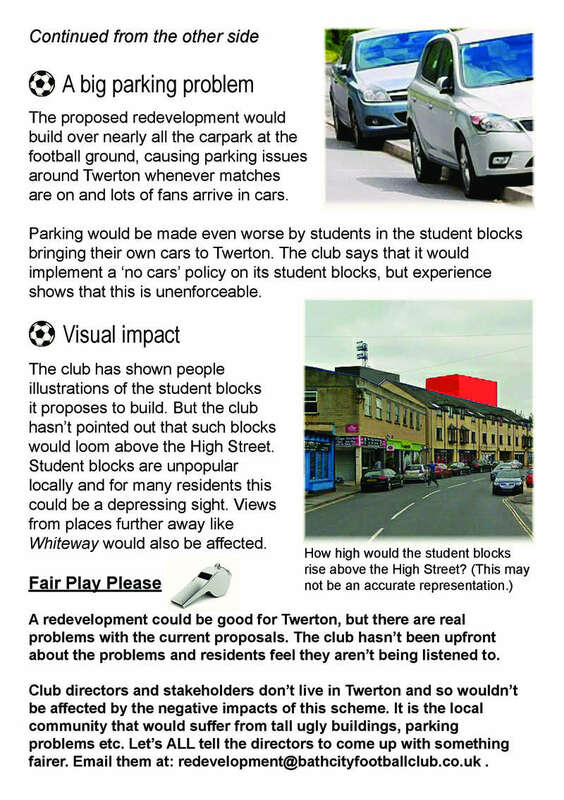 A short while ago, flyers went through 600 doors around Twerton Park, informing residents that the issue of visual intrusion (big blocks rising above the High Street) would be a feature of the redevelopment scheme as it is currently proposed. Now I see folk on another thread of this forum, wondering why nobody from the community turned up to your fun events on 12th May. Alienating the community carries consequences. How do lots of local people feel about May and Ken Tang and their Magic Wok takeaway? Well, in 2007 a developer proposed demolishing the premises and building something else. And in just two days, the Magic Wok compiled a petition of 2000 names in protest. Now in 2018, local residents have been hitting the High Street, getting other resident fired up about the probable loss of the Magic Wok. They won't care that you can express hard-mouthed legalistic justifications for the demolition. They care that Twerton is going to lose a much-loved takeaway and a family that have served this area for 19 years! Something that might have been avoided if the football club had acted on its rhetoric about the redevelopment being for the community and negotiated to save the Magic Wok somehow. 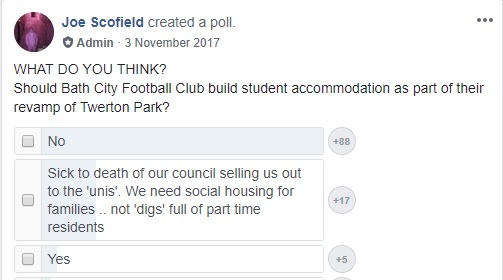 Not meaning to be rude, but your legalistic arguments and the loss of the takeaway, coupled with ugly big student blocks, are just the sort of thing that can make the football club very unpopular locally. It's your choice: put out whatever narratives you want. However, I know that very many Bath City fans are more warm and empathetic in their responses. The surveyors have come to sound out the Magic Wok premises. One of the team was present and informs me that May is very worried. Some people in the flats above the High Street are also worried. You see: the Tangs got a letter advising them of the surveyors' visit. They also got a letter telling them to leave by December. People in the flats similarly had a letter advising them that surveyors were coming to look at their homes. Now they're wondering if they're about to get a notice, like the Tangs had, advising them of eviction. We don't know what to tell them. Are they going to be evicted soon? Are they to be replaced with students at some point? Did the football club seek any assurances over the future of these people in the redevelopment? Did the club care? If any helpful information can be supplied on this matter I'd be grateful and I'll pass it on. Am I the only person getting thoroughly bored by these long posts from Joe Scofield? I think we have got the message that he is opposed to the redevelopment, and clearly thinks that he speaks for the whole community. I wonder whether it might be an idea for the club or the developers to take the initiative here and make some sort of statement? Interesting thing about the Magic Wok is that customers often use the parking at TP when waiting to collect their takeaway. If the club and owner of the land strip blocked this action where would all those customers park? LB wrote: Am I the only person getting thoroughly bored by these long posts from Joe Scofield? I think we have got the message that he is opposed to the redevelopment, and clearly thinks that he speaks for the whole community. They can mostly be summarised in one short line - people don't want students living near them. Threaded throughout his responses is an implicit suggestion that the development is all about and for student accommodation, which is pure nonsense - as that's only a relatively small part of the physical plans (yet delivers a key part of the financial plan. So no students - no regenerated High Street for the locals). Again - his last message re the Magic Wok includes the line "Are they to be replaced with students at some point? ", even though he himself produced a map here which clearly shows that the space where the Magic Wok is located is allocated for COMMUNITY FACILITIES and NOT for students. This is a prime example of the whole scheme being rejected by demonising students - even the bits that have nothing to do with students. How can you try to have a rational debate when faced with what is effectively unreasonable anti-student sentiment ? I wouldn't like to get stuck in a conversation between Jo and Marc. Not sure who my money is on in that scenario. It is good that there is to be some engagement with the club. But when I say engagement I mean listening as well as talking. 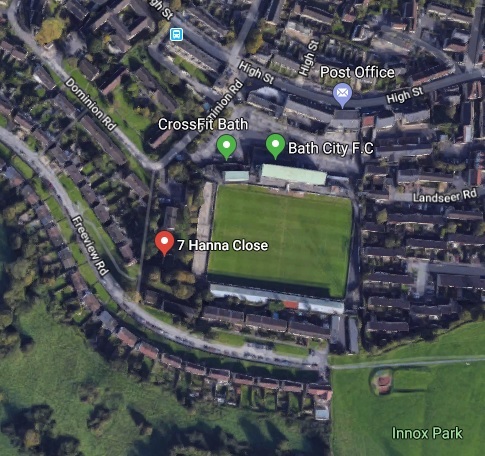 In July this year, the points made in the flyer shown near the start of this thread, as well as other observations about the football club, will be going through over 3000 doors across South West Bath. 1) People who attended previous consultations were shown proposals, without the significant problems with the proposals being pointed out. The feedback from those people channeling into the third stage is thus not properly informed. Those same people might not attend a third consultation stage to hear about the problems and be able to comment. 2) There’s usually a tapering of resident participation by the time of a third stage consultation. Residents say, “Well we’ve already told you what we think,” and don’t attend. So, if the plans continue as they are, the ‘bombshells’ – the big blocks rising above the High Street and all the parking issues – would be revealed (if at all) when the least number of residents are present to comment. There’s been some concern over my argument that Mr and Mrs Tang’s Magic Wok takeaway is to be removed to “make way for students”. Fine. I can revise that detail. 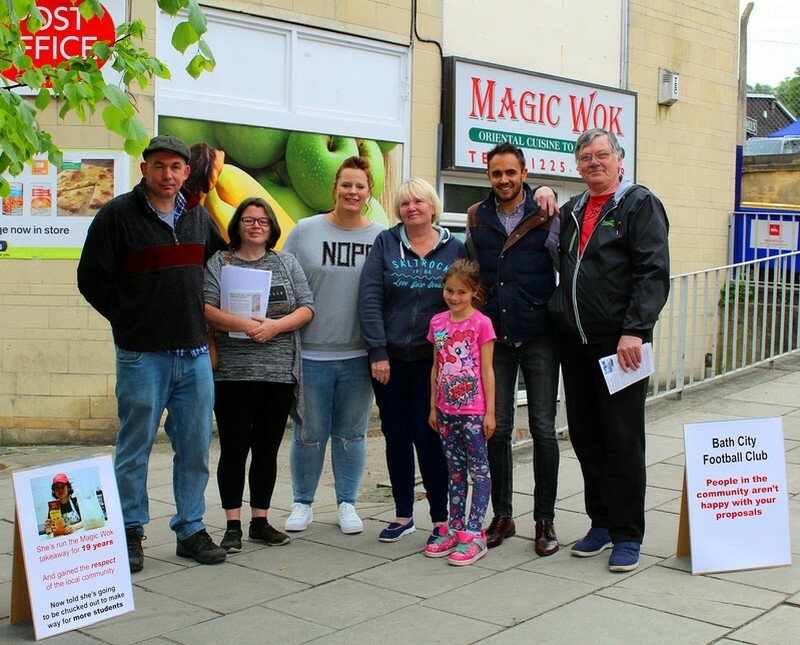 The latest on the Magic Wok, is that the Tangs looked at the cost of setting up in the Twerton Chippy or another retail unit. Just the money needed to adapt the kitchen to serve Chinese food would come to around £40,000. May was talking about it last night but was clearly daunted and worried about the prospect of finding and investing that kind of money. So you see, it’s quite likely that the Tangs will lose not only their business at the Magic Wok, but also their trade. This would mean losing the dignity of using their skills to run their own livelihood - and having to look around for some other kind of work. A cleaning job maybe? Very many people in Twerton love the Magic Wok and don’t want it to go. But this is another consequence of the redevelopment that the football club negotiated. I’ve been given a nudge to remain within forum rules. But perhaps there is margin to say that I feel sick to the stomach with the football club board. Some of the flimsy arguments that I’ve heard, which try to bat away the issues, are repellent also. Thanks for that. I think would-be fans and supporters do need to be informed as to what kind of crowd they'd be involved with, if they were 'in'. What's your view of the redevelopment?